Thanks man! I really appreciate your help! I have plenty in stock with more parts on the way. I should hopefully have them up on the website in the next couple days. 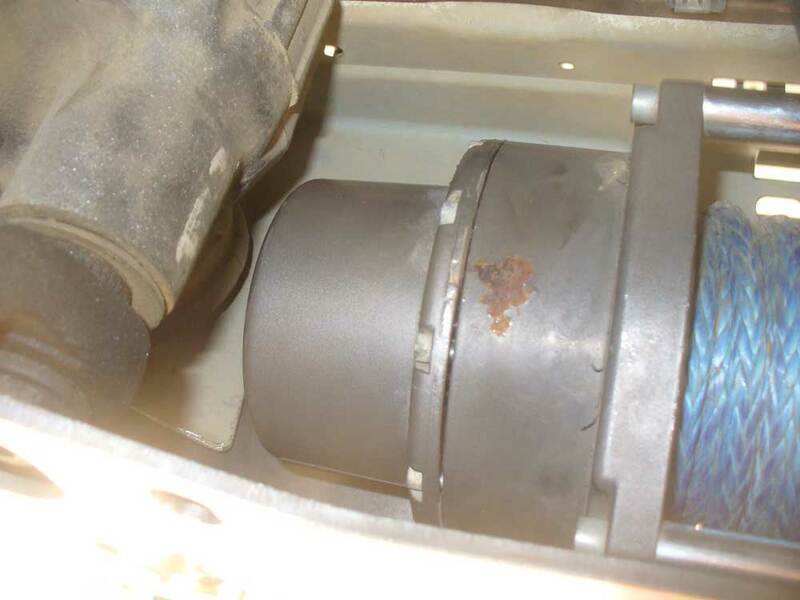 BTW, I also have a new free-spool adapter that will work with most Warn winches now available. It allows you to use any common 3/8" ratchet extension to access the winch through your bumper. That looks like a much better idea than trying to weld an extension to the original lever. ETA: These are already on the website and ready to be ordered. Last edited by Anak; December 7th, 2017 at 07:34. Got mine in the mail yesterday! Thanks Bryson. Looks like a very nice part. After I spend the weekend replacing my heater core I will have to get to installing it. To make the clutch handle easily accessible, stand the winch up on end so the housing is straight up in the air. Next, remove the 10 screws from the end housing then you can lift the winch up about a 1/4" and rotate it every two holes to the desired position. Reinstall the screws and you are done. I tried to rotate my M8000 180 degrees but there was a slight gap (about 1mm) between the ring gear and drum support when the screws aligned. My winch is brand new so the gaskets were not torn. 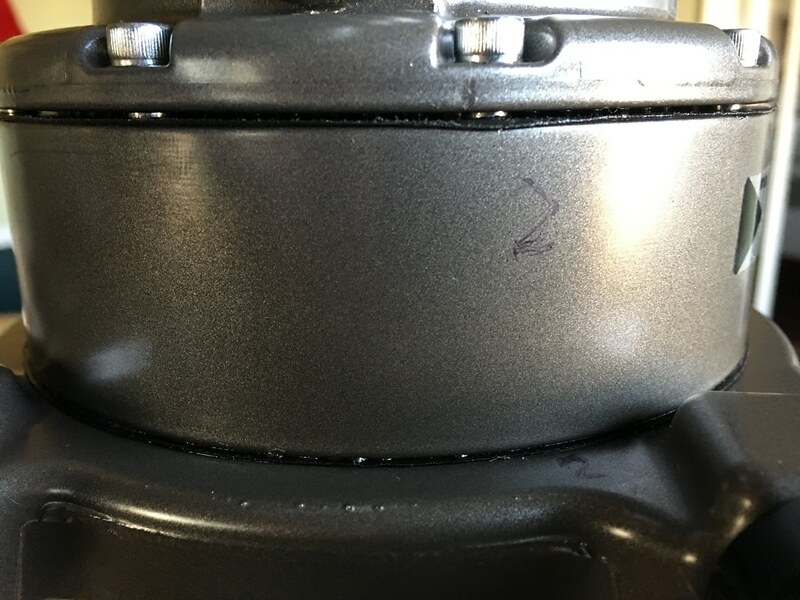 If I took out the screws and turned the ring gear slightly it would seat tightly against the Drum Support but then the screws wouldn't align again. I completely removed the Ring Gear to see why it wouldn't seat with the Drum Support. 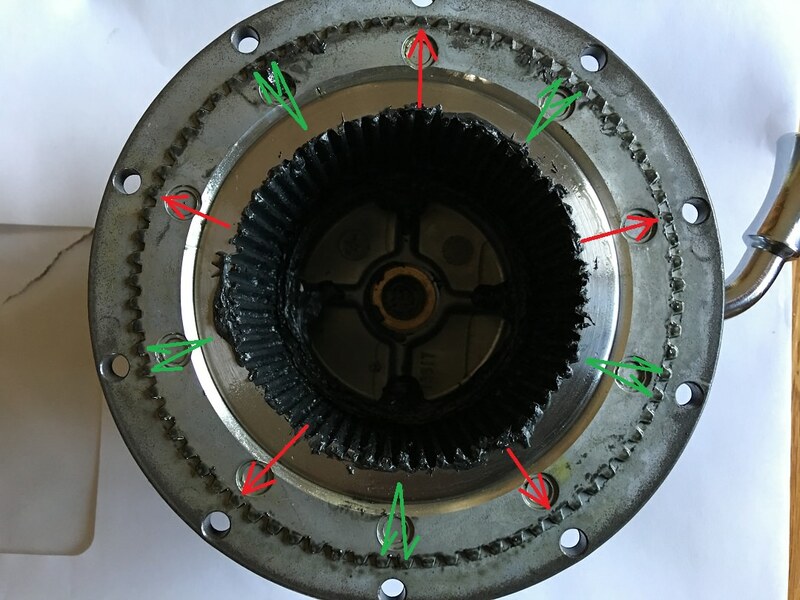 What I found was The Ring Gear teeth align to fixed raised teeth in the Drum Support. Noticed the gear teeth next to the ten screw holes adjacent to the Ring Gear had a repeating pattern every two holes. Therefore the Free-spool lever can be turned every 72 degrees which doesn't compute to 180 degrees. Positions would be, 0, 72, 144, 216, & 288 degrees.I wrote Warn Industries to ask what specific damage could result if I left it at 180 degree but sealed the gap. Of course Warn took the easy route answering my question but those teeth in the Drum Support were engineered to carry the rotational load not the ten screws. Curious if anyone has had any issues with winch damage or water infiltration clocking 180 degrees not every 72 Degrees (star pattern). Just to be clear. I really like the design of the comp mount and mounting the winch in the same direction of the pull. Winch free-spool clocking to 180 degrees isn't a game changer for me. I'm just making sure I don't cause a problem down the road when I need to rely on the winch. In other words, just rotating the very end housing. Last edited by Boostwerks.com; December 12th, 2017 at 12:53. Yes, I tried that first. Unfortunately the video doesn't show a close up of the End Housing matched to the Ring Gear. One of ANAKs pictures does even with the broken seal one can see the gap. It's subtle but there. The End housing has the same raised teeth that match lock into the Ring Gear, every other tooth. I'm trying to think through why the winch would be engineered to lock the Ring Gear to the End Housing and Drum Support without depending on the screws for rotational torque. 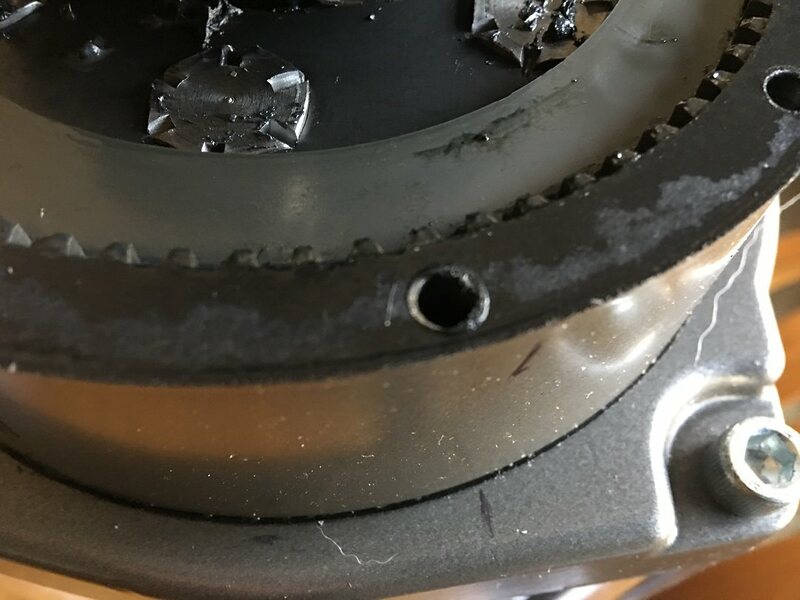 Sure the gap has to be filled to keep grease in and water out but is there really that much torque on it. I suppose one could re-drill the Ring Gear or drill and tap the Drum Support. Warn probably wouldn't warranty if it ever broke. Last edited by Greenz; December 12th, 2017 at 15:49. Now that I have the new selector piece from Bryson (absolutely beautiful machining btw) that winch is back up on my priority list. I will clean everything up inside and see what there is to see with the aligning of all the important bits inside. That gap you see in that picture is not entirely a conclusion. Knowing that I was waiting on new gaskets I did not bother to do anything about the old ones. In some places the gasket stuck to one side, in others it stuck to the other side. What you see is the thickness of two layers of gasket in a place where there is no gasket at all. At the time I was more concerned with macro level fitment issues. I’ll be ordering the selector adapter too. Regardless of the orientation, it looks useful. Will be waiting for your assessment on the fit. We might be looking at a serial number change in the parts machining but Warn was aware of what I’m talking about only working every other hole. When I get home from work tonight, I’ll tear mine apart and get pictures. Might be easier to see the issue in real time. This Picture is the End Cap With the raised teeth. Notice the teeth across from the mounting holes. Red=single tooth Green double tooth. 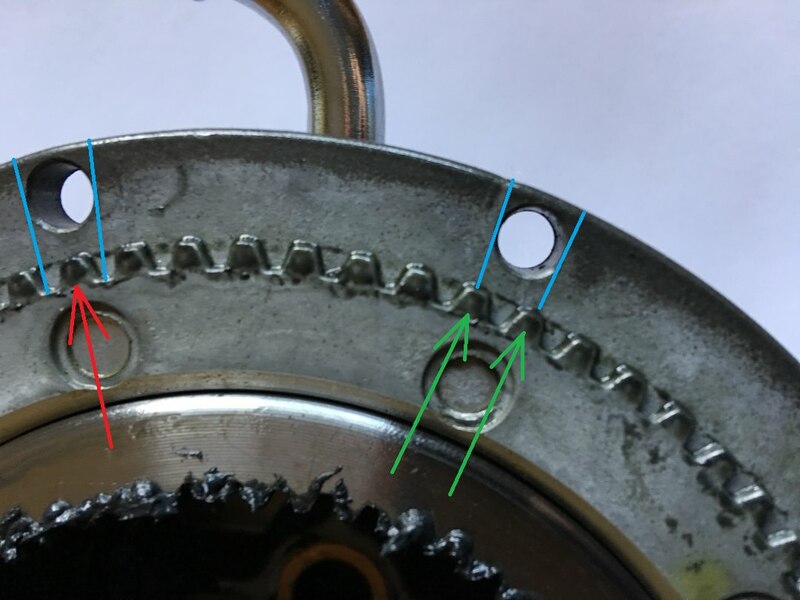 If rotated 180 degrees where the screws align through End Cap, Ring Gear, and Drum Support the teeth will not mesh interlocking and it will create a gap. I will take a good look at what is going on with mine. Why they wouldn't just make the tooth count correspond with the hole pattern seems like dumb move. I thought the same thing. It might be the number of notches carry a load like splines in a shaft. It would take a lot of force to shear that many notches all at once even in the castings. The math probably dictated the number of bolts versus strength. Less or more than 10 screws equal too weak. Just didn’t fit to rotate in 90 degree increments. Got the winch mounted today to see where the free spool lever will point toward the bumper. Will mount it at the 216 degree angle. This means I will need to punch a new hole in the Comp Mount and through the top of my bumper. Will also need to modify my bumper for the fair lead opening. Now that the winch is in place I can measure for new cable lengths. Also Got the pillow block mounted. Really tightened up the steering. I can feel that it is more responsive. Had to loosen the steering box and pry on on it a little to get the pillow block on. Nice job on the video. The reference grid is a good idea. Now you need to shoot the same thing, but with the support bearing in place. As to the selector placement, are you running the stock bumper? I am interested in seeing your progress on this. I would like to be working on mine, but I think my rear main oil seal is going to take priority.